Home / Political News / Current News / PM Oli under the western grip? PM Oli under the western grip? 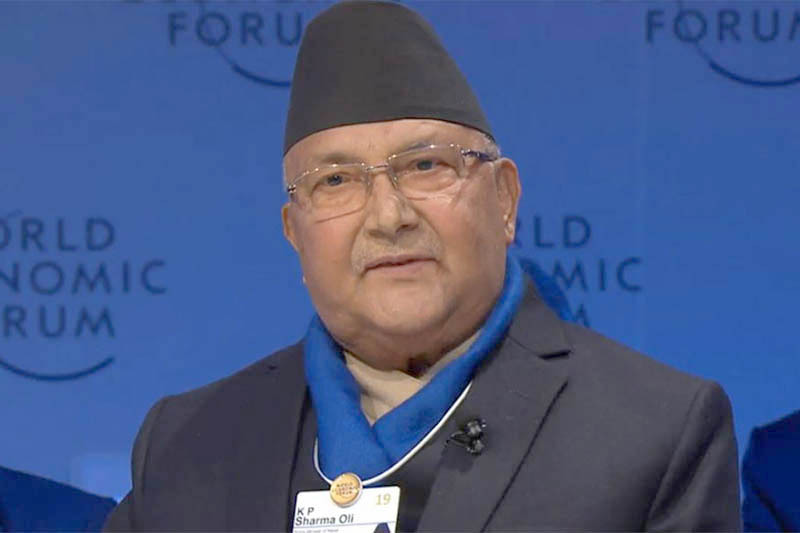 Prime Minister KP Sharma Oli returned home last week after attending the annual meeting of the World Economic Forum (WEF) in Davos, Switzerland. PM Oli addressed the Forum and has hoped that he has paved the way for foreign direct investment in the country in the long-run. WEF is the forum of world’s top businessmen and political leaders. This forum is also known as the forum working in the vested American interests. Prime Minister Oli is keen to receive an invitation to visit Washington as an American guest. As preparation, his foreign minister Pradeep Gyawali recently visited Washington. During Gyawali’s meeting with his counterpart Michael R. Pompeo was, U.S. Secretary of State , in Washington, the American side lauded Nepal’s key role in the Indo-Pacific Strategy. However, nothing about the Strategy has been mentioned in the press release issued by Nepal’s Foreign Ministry after concluding of Gyawali’s Washington visit. It can be assumed that obviously, the American side asked Nepal to become active in the Indo-Pacific Strategy. So far, Gyawali might have escaped saying that the Nepal government would conduct a study on that. Sources say that Nepal is under strong pressure from the US to join Indo-Pacific Strategy, which is the American strategy to encircle China by using small and big neighbours of China in the region. Americans have announced millennium grant support for Nepal’s infrastructure development – specially on the area of electricity and road. Besides, Americans have assured for supplying sophisticated arms and sky-trucks, helicopters for the use of Nepal Army. Sources say that if Nepal will deny to join the American club, these supports will not be released. Furthermore, the World Bank, IMF and ADB support for Nepal will be curtailed, say the very sources. On the other hand, after adoption of federalism, Nepal’s general expenditure has increased by many folds and Nepal’s internal resources cannot meet the expenditure for institutionalization of the federal structures. As Yubraj Khatiwada is aware about the US dominated financial institutions, Oli had assigned him as the finance minister to manage fund to run the country. Arjun Bahadur Karki, Nepal’s ambassador in the US, an INGO expert and thus Oli is under the trap of Khatiwada and Karki while bringing him in the pro-US and anti-China camp. Oli himself has wished to develop an international image. Americans have understood Oli’s ambition better and they are ready to develop oli’s international image if he will join the American camp. However, especially during the time of ongoing cold war between the US and China, to aside with the US can be expensive for Nepal.